What are polycarbonate roofing sheets? They are a roofing material that can used in a number of ways and the best polycarbonate roofing sheets provide a great roofing solution for your polycarbonate roofing systems, from carports and canopies, to conservatories and rooflights. At Omega Build we supply a full range of multiwall polycarbonate roofing sheets such as 10mm polycarbonate sheets, 4mm polycarbonate sheets for greenhouses, carports, canopies,conservatories & rooflights and 16mm polycarbonate roofing sheets. They can supplied as either stock rectangles or polycarbonate sheets cut to size for your required size. If you require advice on suitability for your project please contact us. We will be happy to help with your polycarbonate sheet roofing requirements. We can supply a range of polycarbonate from the major manufacturers such as GE Sabic (Lexan), Palram (Sunlite), Ultraframe (Ultralite500) and Brett Martin (Marlon) perfect for polycarbonate roofing systems. If you are trying to match a type of polycarbonate not shown in the table below, please contact us as we can also supply other types of polycarbonate sheets for sale such as upvc corrugated roofing sheets. Which roofing sheet is best for your requirements? Our informative table below outlines the thicknesses, colours and uses that will enable you to compare which roofing sheet is best for your individual requirements. The product name links directly through to the product catgeory, enabling you to find out more about each one and to purchase it online. We also have some special offers that you may be interested in. This thickness of sheeting is very popular with greenhouses, as it provides a more affordable and safe alternative to using glass for greenhouse glazing. This thickness is used for projects that require a thicker, sturdier solution. This typically includes usage with carports, lean to roofs, canopies and the like. Again this thickness is used for the same as the 10mm sheet, along with usage in conservatories. The thickest poly we supply are generally used for building conservatories. They can be used for the construction of a new conservatory, or to repair an existing panel(s). At Omega Build all our products are available to buy online and sent from our factory in sunny Devon. Delivery can be made to all parts of the UK and having been in business since 1990, we have a wealth of experience and knowledge in this business sector. We recommend using polycarbonate roof panels, rather than glass for projects like the above as they are 290x stronger and less than half the weight of glass. As well as less weight, they are less expensive and there are added advantages such as less need for such strong support structures for buildings, which also offers you a saving. Our plastic roof sheets also provide superb thermal performance and fantastic spanning properties, making them ideal for your roofing projects. Q/ What thickness poly should I use for a roof? A/ We recommend using 25mm or 35mm Polycarbonate Sheets for conservatory roof glazing. The thicker glazing, allows it to gain better insulation levels and optimum U values. 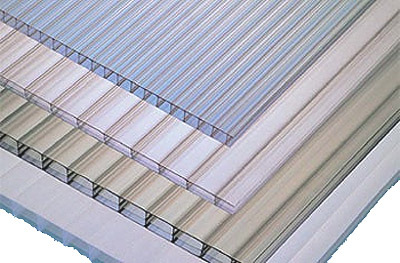 Q/ How long does polycarbonate roofing last? A/ If you have installed it in a professional manner, there is no reason why your roofing won't last for 25 years or even longer. It has a long lifespan as polycarbonate roofing is a lightweight thermoplastic material with an amazing ability to withstand very cold or hot temperatures. Q/ How do I cut polycarbonate sheets? A/ There is a great article on Wikihow about how to cut polycarbonate. Q/ Does polycarbonate block UV rays? A/ Polycarbonate can withstand extreme amounts of force and are nearly unbreakable. ... With it's UV blocking capabilities it is a perfect material for constructing affordable additions to your property. The properties of polycarbonate also make it the ideal material for the construction of greenhouses, also know as greenhouse glazing sheets . Q/ Can poly sheets be drilled? Polycarbonate panels are supplied in Clear, Bronze or Opal and there are an enormous range of uses for it including, greenhouses, temporary glazing, carports, replacement secondary glazing and open-sided structures to name a few. Our polycarbonate roof sheets are UV protected and available in a range of sizes, ideal polycarbonate sheets for roofing. While you are here you may like to look at our polycarbonate sheet products on Business Magnet. Our information section of our site contains more details and info sheets on our products. See our information sheets. If you require pricing for non-rectangular shapes please e-mail, fax or post your plans to our office for a custom cut to size quotation. To read about how adaptable polycarbonate is why not read about Polycarbonate here and how to improve your home with a polycarbonate roof. See secondary glazing in our online shop or visit the home page of our website for more information about polycarbonate roofing systems.